Conservatives say they hate identity politics, but they practice a particularly crude version of them. For a movement that so often disdains identity politics, conservatives sure love to deploy them. In 2008, Sarah Palin’s vice presidential nomination was a risible, tone-deaf attempt to capture women voters disappointed by Hillary Clinton’s primary loss. After Barack Obama became president, the GOP attempted to shed its overwhelmingly white image by putting the clownish Michael Steele in charge of the party. And now, Carly Fiorina is counting on conservatives’ desire to counter excitement over Clinton’s renewed ascendency with a lady candidate of their own. Fiorina, a failed CEO who has never held any sort of elective office and rarely even voted before her entrance into politics, is clearly not going to be the Republican nominee for president. She probably knows that—my guess is that she’s running for vice president, and, failing that, a Fox News gig. It’s a clever move for a political opportunist, because there’s a vacancy on the right for a female anti-feminist. With so-called women’s issues poised to play an unprecedented role in the upcoming election, Republicans need someone who can troll Hillary Clinton without seeming sexist. Michele Bachmann and Palin aren’t in politics anymore, and anyway, they’ve turned themselves into national jokes. Fiorina is stepping into the breach. Because women are not, as a gender, deeply stupid, this probably won’t work, just as it didn’t work during Fiorina’s failed campaign against Senator Barbara Boxer in 2010. (A campaign in which she was caught on an open mic snarking about Boxer’s hair). 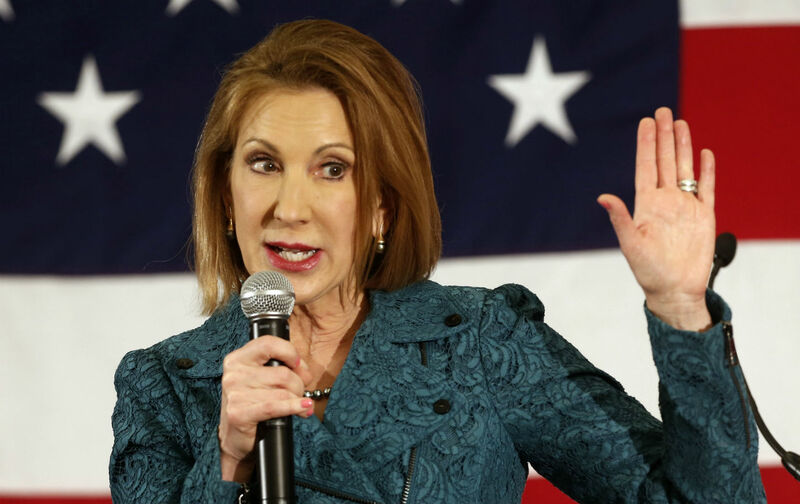 Fiorina, after all, is as bad as any of the male candidates on issues of unique concern to women. She’s implacably anti-abortion: “Liberals believe that flies are worth protecting, but the life of an unborn child is not,” she told the Iowa Freedom Summit earlier this year. She opposes raising the federal minimum wage—an issue of especial salience to women, who make up the majority of minimum-wage workers—and is against equal pay laws. The question, then, isn’t whether Fiorina will appeal to women, but whether Republicans are blinkered enough to think that she will. If there is a Fiorina boomlet, it will suggest that the GOP has learned very little in the last eight years about why women reject it, and is thus at a disadvantage going in to 2016. A couple of weeks ago, John Fund wrote a National Review piece headlined, “Fiorina Has Hillary Defenders Worried.” It’s hard to believe that Republicans actually believe this, but then again, they did put Palin on a presidential ticket, so fingers crossed. Editor’s Note: An earlier version of this piece mistakenly identified the former head of the RNC as Michael Brown, not Michael Steele. The piece has been corrected.